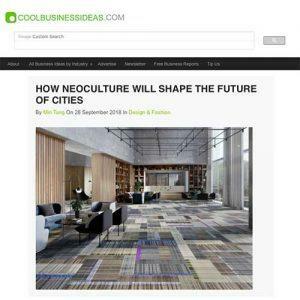 Tarkett Interview – How Neoculte will shape the future of cities? Very insightful article in CoolBusinessIdeas.com, an online magazine with new business ideas and innovations around the world. The article refers to a podcast interview recorded earlier this year with Chris Stulpin, Tarkett Chief Creative Officer. The podcast interview focuses on the concept of Neoculture – the current cultural and societal shifts – and how this new concept impact architecture and interior design. As explained in the article, this societal change includes shifts in various aspects including sustainability and wellness. In the interview, Chris Stulpin, Tarkett’s CCO, explains how this societal shift and this new consumers’ focus on wellness has influenced Tarkett to innovate. A focus on wellness has also motivated Tarkett to make changes: “we’ve been developing a flooring portfolio that solves virtually every installation and maintenance problem, especially high-moisture substrates, since that’s both an issue for installers and a threat to our health as end users in the space. We’re increasing our offering of asthma & allergy friendly® certified products and continuing to focus on providing the industry’s lowest TVOC emissions from our materials. We were the first flooring company to have products that are Living Product Challenge, Cradle to Cradle, and asthma & allergy friendly® certified,” Chris explains. Tarkett is an international flooring companies who has developed an innovative range of healthier flooring products, has passed our strict scientific standards and has been CERTIFIED asthma & allergy friendly®.